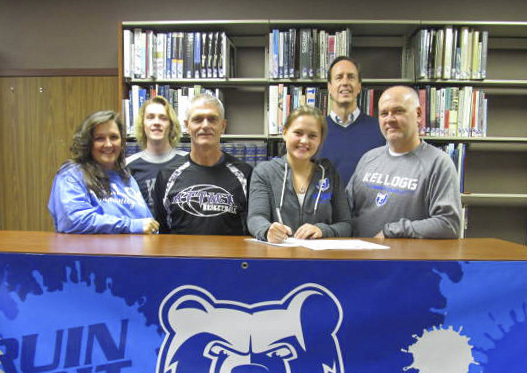 Nina Winkler, of Battle Creek, has signed a National Letter of Intent to play women’s basketball at Kellogg Community College and will begin playing for the Bruins next season. Winkler was a four-year starter at St. Philip Catholic Central High School, the 2017 district Class D champions, averaging 9 points, 3 assists and 3 steals per game her senior season and earning All-City and All-SCAA honors in St. Phil’s Southern Central Athletic Association conference. For more information about women’s basketball at KCC, visit www.kellogg.edu/womens-basketball or contact Coach Doumanian at 269-965-3931 ext. 2524 or doumaniand@kellogg.edu. Pictured in the above photo, from left to right, are Jeanine Winkler (mother); Jeremy Winkler (brother); Attack Basketball coach Alton Tucker; Nina Winkler; head KCC women’s basketball coach Dic Doumanian; and Jeff Winkler (father).